While studying intently, I couldn't help but notice squawking noises of birds in the trees outside my home. I often hear birds outside, but not the chatter that this crowd was making, so I looked out to see what was up. 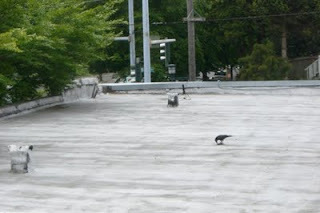 The racket was coming from within the leafy heart of the tree and I was unable to see the perpetrators, but soon enough, just as my interest was waning, a crow appeared on the roof of the building next door. It had something in its mouth. In its mouth, and soon at its feet, it was holding a small, dead bird; it was a bird of a different species. 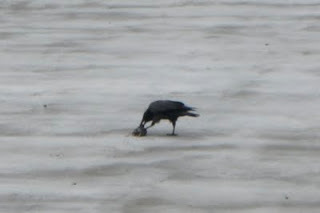 The crow began to peck at the dead bird, then looked up toward the tree, than pecked again. I'm no expert in bird communication or body language, but it looked like the bird was saying, "See this, I'm pecking your little Marvin, breaking his spine, then eating the marrow inside. He's a tasty little guy." There was a considerable amount of squawking from the tree, as I could only imagine Marvin's family looking on in horror as their little birdie baby was being devoured by a huge crow. The crow moved his prey several times, as if keeping in direct line of sight with the prey's peeps. Eventually, crow took his kill up to a lightpost and one of Marvin's peeps followed close by, keeping at a safe distance in a tree. As per usual, whenever I don't know something, I google it. So I googled "crow killing birds" and found that crows do indeed kill birds, usually sparrow and in the spring when the sparrows are young. 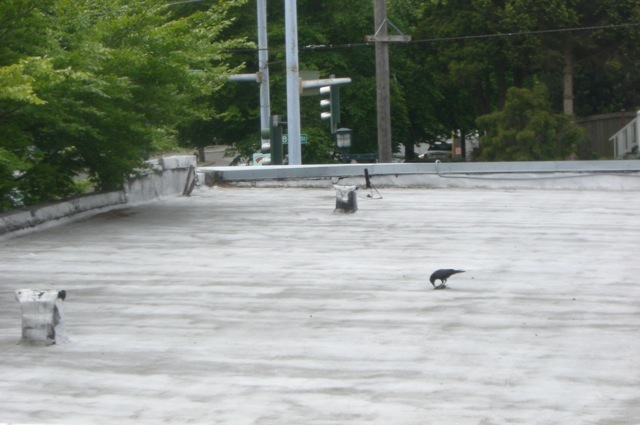 So I got to witness a part of the lifecycle of a crow and sparrow, right from the comfort of my home.